Have you ever thought about how we were able to predict the tides before the advent of digital computers? The very first attempts at predicting the tides were made as far back as the 11th century and were for a long time based on simplistic rule-of-thumb methods. Other methods were gradually developed and improved resulting in long calculations incorporating many factors such as the gravitational pull of the moon and the sun, the rotation of the Earth and the ever-changing distance between the Earth and the moon, being done by hand. The more factors taken into account, the more accurate the predictions would be. Towards the middle of the 19th century there was increasing pressure from commercial shipping lines who wanted a greater number of more accurate predictions more quickly. Something had to be done to increase the number of factors that could be calculated, and to increase the speed with which the calculations could be made. 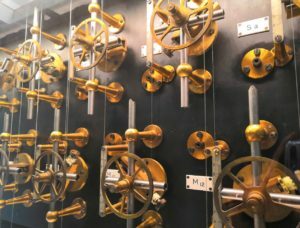 The Tide & Time exhibition at the National Oceanography Centre in Liverpool will introduce you to two marvellous mechanical machines that were developed to do just that. These analogue computing machines are known as tide prediction machines. 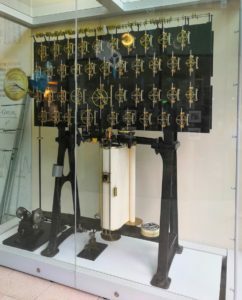 The construction of the first ever tide prediction machine was completed in 1873 to a design by William Thomson (who later became Lord Kelvin) and with the help of Edward Roberts and Alexander Légé, whose company manufactured it in London. Known as Thomson’s First Tide Predicting Machine, its development was made possible thanks to funding from The British Association for the Advancement of Science, now the British Science Association, who decided that calculations done by hand alone were no longer adequate for the prediction of the tides at ports around the country. Tide prediction machines are made up of a system of pulleys, each representing a different factor, known as a constituent, that influences the tides. The time of high and low tide for any port on any day of any year in the past or future can be calculated by the machines, given the corresponding initial values. Interestingly, only 33 of these analogue computing machines were ever made, and 25 of them were constructed in Britain. Now they are located all over the world, from Japan to Argentina, as they were shipped to countries that wanted to predict their own tides by using one of these machines instead of doing the long calculations by hand. Tide prediction machines became redundant in the 1960s with the development and adoption of digital computers, which were able to calculate the tide predictions even more quickly and accurately than ever before. The National Oceanography Centre’s Tide & Time exhibition showcases the role tidal science had in turning Liverpool into a major port and the city it is today. 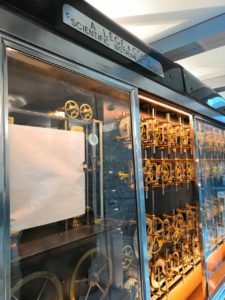 It is the only place in the world where you can see two of these machines together: the Roberts-Légé machine, built between 1906 and 1908 by Légé and Co. in London, and the Doodson-Légé machine, built in 1950 by the same company. These two machines were installed at Bidston Observatory on the Wirral Peninsula in 1929 and in 1950 respectively, where they were used by Liverpool Observatory and Tidal Institute to predict the tides at national and international ports. Both of these machines are now owned by National Museums Liverpool and thanks to their recent renovation work the Doodson-Légé machine is exceptionally in working order, as may be seen during a visit to the exhibition. 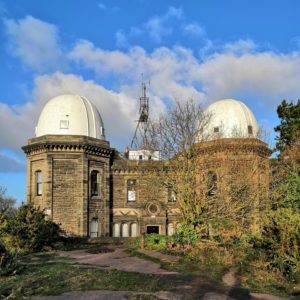 Once housed at Bidston Observatory, Liverpool Observatory and Tidal Institute pioneered the modern scientific study of tides, acquired a worldwide reputation for tidal prediction and became a world-famous centre for sea level and tidal research. Although the building is now privately owned, it is still possible to walk around Bidston Hill to see it from the outside, a visit which, on a fine day, will be accompanied by magnificent views across the River Mersey to Liverpool. These machines performed life-saving calculations and made a crucial contribution to maritime history. Go and see them for yourself and marvel at the beauty of the science and engineering work that went into creating these extraordinary mechanical machines!